Steve Benen at MSNBC doesn’t think that is funny. That’s great news for those of us who don’t have families on this planet. Now, as a factual matter, Romney’s promise is itself rather strange. How “you and your family” will benefit from less access to affordable health care, less access to education, and fewer investments in roads and infrastructure is something of a mystery. But even putting that aside, the aspect of Romney’s comments that was simply astounding was the ignorance. The Republican treated rising sea levels as a punch-line, as if the very idea of addressing the climate crisis is ridiculous and those who take this seriously are fools worthy of mockery. Indeed, the Republican audience took their cues, literally laughing at Obama’s efforts to address global warming. Also notice that, in Romney’s mind, there’s a distinction — the nation can deal with the climate crisis or we can help families, as if the two have nothing to do with one another. When people in the future look back at Romney’s contempt for the idea of “slowing the rise of the oceans,” and his party’s willingness to bury their hands in the sand, history will not be kind. Maybe I should explain the joke to him. The reference is to this speech that Barack Obama made just before the 2008 election. For a politician to claim that his election will stop the rise of the oceans and cause the planet to heal is insane. Obama should have been laughed off the stage for saying something like that. 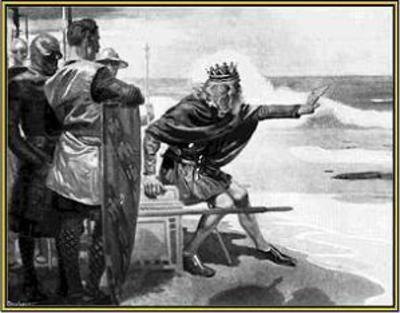 It sounds like Canute commanding the tide to halt, or something mad that one of the crazy Roman Emperors, who though they were gods might say. The fact that many of Obama’s followers really seemed to believe Obama was some sort of savior is disturbing. Sane people see such statements as ridiculous and worthy of derision. The Democrats seem to be upset that several speakers actually made fun of the President at the Convention. Well, to make a slight alteration of a famous statement of Winston Churchill’s, Obama is an proud man, with little to be proud about. This is America. In America, we do not worship our leaders. We mock them, especially when they seem to believe that they are doing us all some very great favor by deigning to rule over us. Barack Obama’s arrogance, as seen in that line of his speech, just cries out to be mocked. Besides, like most people who are full of themselves, Obama has a very thin skin. If the Republicans keep teasing him, keeping it light and humorous, he will show the very ugly side of his personality. I am looking forward to the debates. Rising sea levels aren’t funny (maddowblog.msnbc.com) Well, neither is having a President who thinks he can control the tides. I haven’t posted anything since Monday so you might have thought that I have given up on this blog, or had been abducted by aliens. I try to write something every day and I don’t think that I have gone five days without posting before. I have been very busy this week. To start with, Labor Day is coming up so we are approaching one of the weekends of horror. I have worked late everyday this week. In addition we have have Gospel Meetings at our church. A Gospel Meeting is when we have a guest preacher come in and give sermons all week. This time we had a preacher from Georgia named Joseph Casimier. He was really good and we actually went every night but Monday. On Monday, we attended my son’s Boy Scout Court of Honor, where they handed out merit badges and promotions. The Republican National Convention was also this week. I didn’t pay to much attention to it. I like reading about politics and history, but I don’t much care for watching politician’s speeches. I gather it was quite a successful one for the Republicans. I might look for some clips on YouTube or Unedited Politics. I also have to go through my email. I hope the Democrats sent some good fund-raising messages.